so even though there were signifcant updates I didn’t want to reboot only to, perhaps, discover I have no X Window based desktop system. Maybe Plasma will run under Wayland now that we are getting closer to Plasma 5.12 but I don’t want to risk it just yet. 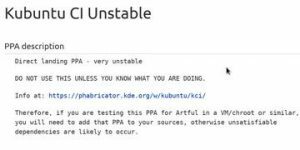 Every day for the past week I was hoping for an update to kwin-common because the longer I leave it the more likely that other conflicting apps, drivers and libs on my system will just crash the desktop anyway. So far that hasn’t happened but I got tired of waiting for an update to kwin-x11 in Kubuntu-CI/stable so I tweaked my sources.list to go to Kubuntu-CI/unstable and sure enough a new set of kwin packages came through. However, right at this moment I still have not rebooted so I will click Publish, do yet another package update, reboot, and update this post with the results! Update: well booting back into Plasma was a sad experience, I think kwin was running but no panels or typical desktop so I logged out and spent the afternoon in the stock standard Ubuntu (GNOME) desktop while I got some work done and did a few more updates. I didn’t last too long being reminded why I really dislike that particular desktop system. After 8 hours of more updates I did a apt install --reinstall kwin plasma-desktop (plus a dozen or so other packages closely related to them) and I am back to my normal desktop. The now current Plasma version seems to be 5.11.80 which I am guessing is about an early alpha version of 5.12, being due for release at the end of January 2018. So it seems by following my gut feel I managed to dodge a bullet and avoid a possible dead desktop while an important low level window manager upgrade was going on. Update2: half an hour later and I changed my sources.list from unstable back to stable and updated again which brought in yet another 38 packages mostly around version 5.11.4. Anyway, I am now back to my normal desktop workflow and also back on kubuntu-ci/stable, where I’ve been for the last month, with slightly less package churn than on the unstable track. All good.